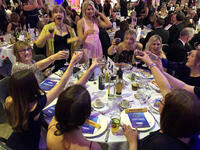 Last November, the firm entered the Devon & Somerset Law Society Awards (DASLS). We put forward five individuals, one team and two firm-wide nominations, with six of them being shortlisted by the panel of independent judges. 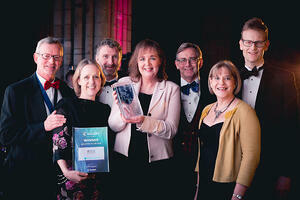 On Thursday 4th April, 30 members of staff, representing all of the Somerset offices and teams, braved the wet weather to meet at Exeter Cathedral for the Awards Dinner & Ceremony. After dinner, DASLS President Stephen Mahoney kicked off the awards. The first award to be present ed was Employer of the Year. Head of HR Deborah Carrington was delighted to hear Porter Dodson announced as the winner of this category and was accompanied by partners Scott Bowley, Nicholas Clegg, Kate James and Cathryn Smith to collect the prize. This award provides affirmation that the firm is recognised as an Employer of Choice across the region. The next award was Client Experience, which saw Business Excellence Manager, Phil Stocker, take to the stage to collect a Highly Commended accolade. This recognition demonstrates our commitment to our clients and our focus on delivering great legal advice when and where it is convenient. As we know, all good things come in threes, and no one was more delighted than Family Team partner Cathryn Smith when Isabelle Day won Support Team member of the Year. Isabelle joined the Firm in 2015 as a secretary in our Sherborne office and is currently being sponsored as she studies for a paralegal apprenticeship through the Chartered Institute of Legal Executives. The Partners recognise that these awards are achieved by hard work, loyalty and commitment, and thank all staff for their contribution towards the firm’s success.